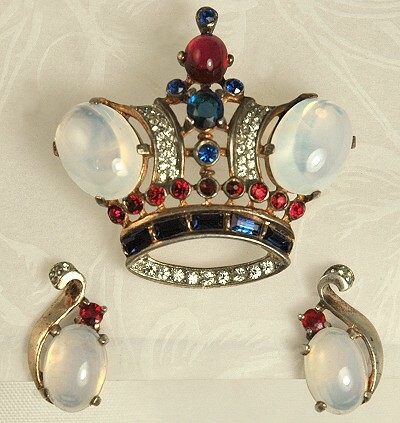 SOLD This red, white and blue crown is one version of the mid 1940s pin designed by Alfred Philippe as seen in the December 15, 1945 issue of Vogue magazine. This patented design was made with different colored Lucite cabs and rhinestones one of which is shown in Marcia Brown's Book Signed Beauties of Costume Jewelry on page 180. You can also see this piece in the book Costume Jewelry The Great Pretenders by Lyngerda Kelly and Nancy Schiffer on page 19. This piece can also be seen in the book Jewels of Fantasy on page 182. The earrings are the clip on type. All pieces are signed. Condition: Very good vintage. Vermeil wear is noted on the reverse bottom of the crown and some expected wear also noted to earrings. There is a tiny ripple in the pin rod. Measurements: Pin: 1 3/4" wide and 1 5/8" long. Earrings: 1" long and about 1/4" wide.